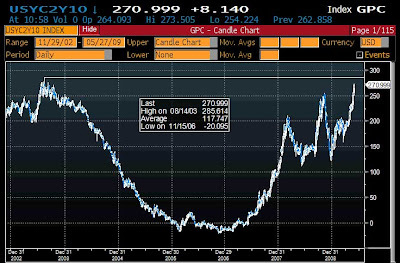 First Treasuries have gotten walloped, to far beyond pre QE levels (the 10 UST is getting monkeyhammered as I type, see below), next the 2s10s curve has steepened to almost record levels (at 271 bps recently, record wide at 273 bps, a mere 2 bps away), and now the pain is slowly shifting into mortgages. 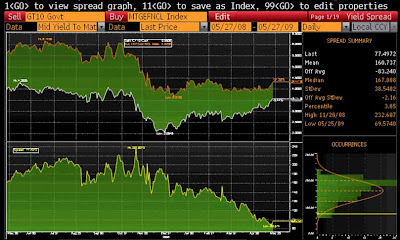 Despite the successful sale of $35 billion of 5 year notes at 2.31% on demand mostly by foreign central banks (who presumably aren't too excited about seeing the Fed overtake them as the biggest US global) credit , the farther end of the curve keeps bleeding on questionable demand, and the 10 Year UST vs the FNMA 30 Year Current Coupon has gotten so uncomfortably tight, that in the ongoing game of bond chicken played between Bernanke and the market the first to blink could well suffer irreparable harm. Naturally, if it is in fact Bernanke who blinks first, the consequences for mortgage rates could be so dire, even Bloomberg has finally picked up on the issue. Yields on Washington-based Fannie Mae’s current-coupon 30- year fixed-rate mortgage bonds climbed to 4.3 percent as of 10:25 a.m. in New York, the highest since March 10 and up from 3.94 percent on May 20, data compiled by Bloomberg show. All that talk of cheap refinancings is now officially out of the window, and all the recent mortgage refi activity which has been the primary reason for banks benefitting from the abovementioned 2s10s curve will cease shortly, absent another major overhaul of Quantitative Easing. So the market is basically saying that it will now only believe the inflation rhetoric if the Fed is willing to throw another $1 trillion in UST/MBS purchases. As Zero Hedge discussed, the Fed's balance sheet is already at a pro forma level of about $3.2 trillion: what happens if its hits the $4 trillion+ stratosphere is anyone's question. In the meantime, stocks continue trading on no volume, hugging the flatline as if everything is hunky dory, totally oblivious to the Nightmare on Elm Street mauling that is going on in the mid/far end of the curve. In fact every micro uptick in the S&P500 (likely the result of a latency burst catching up with the SLPs over in the NYSE) causes another major selloff in 10 Years. 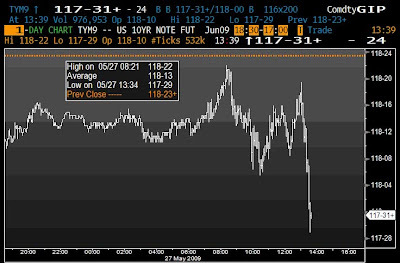 Chart hat tip The Irish Menace, Credit Trader.